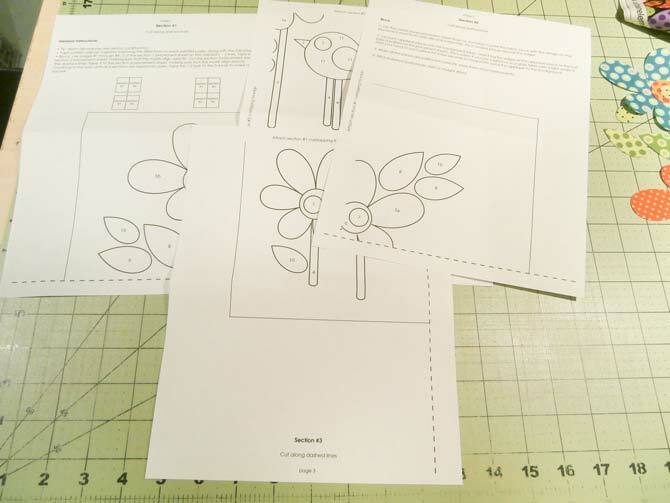 I had such a great time yesterday reviewing these wonderful prefused applique packages that I just couldn’t wait to get started on the easy appliqued decorative cushion project. I have to tell you, today’s project was such a blast, and I had so much fun that I almost felt quilty-naughty. 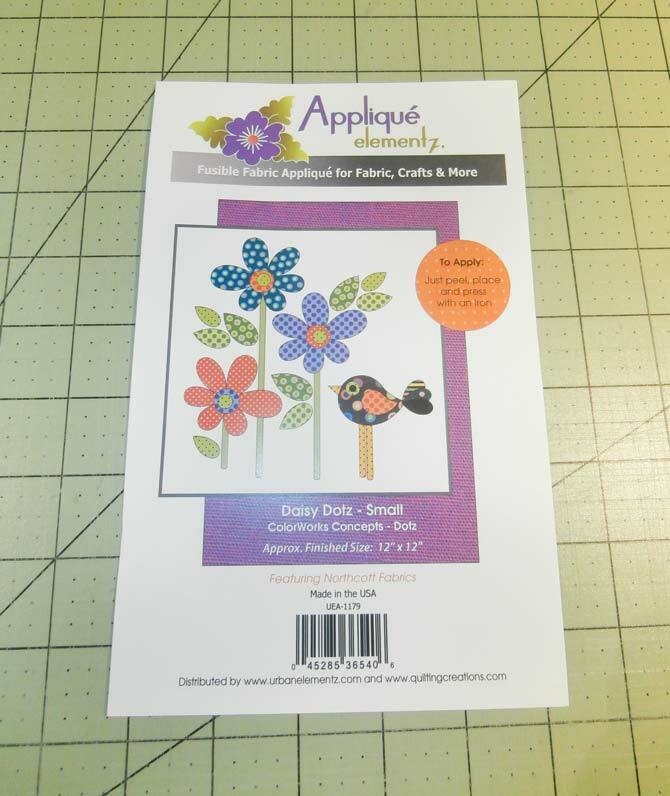 For today’s project, I selected the Daisy Dotz – Small package of fusible appliques from Northcott’s Urban Elementz Applique collection. I just had to create a summer cushion with that cute bird, and flowers. 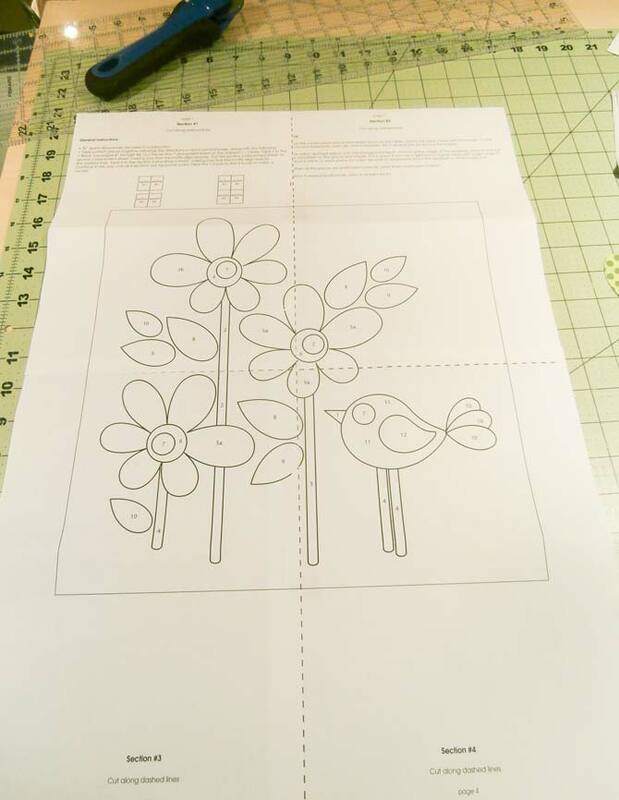 I wanted to review the packet of appliques again as I made the project for today’s blog so as per the instructions, I took out the four pattern sections that were included in the package. Cutting the 4 pattern pages on the dotted lines, I matched them up and taped them together as directed. I ended up with the 12″ square design. I then cut a piece of 12″ x 12″ solid white fabric for the base on my appliqued cushion, and laid it over the 12″ design square. You can see the design through the white fabric, showing me where each of the applique pieces are going to be placed. I used a tiny piece of tape to hold the white fabric in place on the paper design. 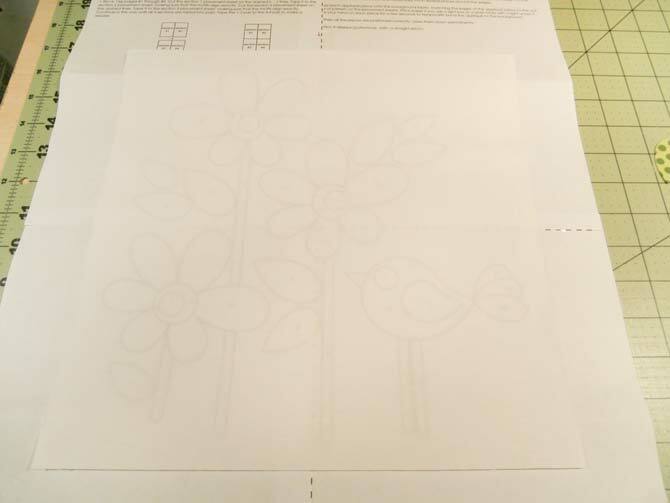 I then started to remove the paper backing from the applique pieces and place the pieces in their appropriate spot on the white background fabric, following the design underneath. This was so much fun. Normally, at this point, I would machine applique the first pieces with a blanket stitch, and then continue to add the layers of the other pieces because it can be easier to applique the first pieces then fuse the other pieces on top as you layer. But, for this project, I decided to do as per the instructions and lay all of my pieces and fuse everything at the same time to complete the panel. Of course, I couldn’t wait to see the complete design coming to life. 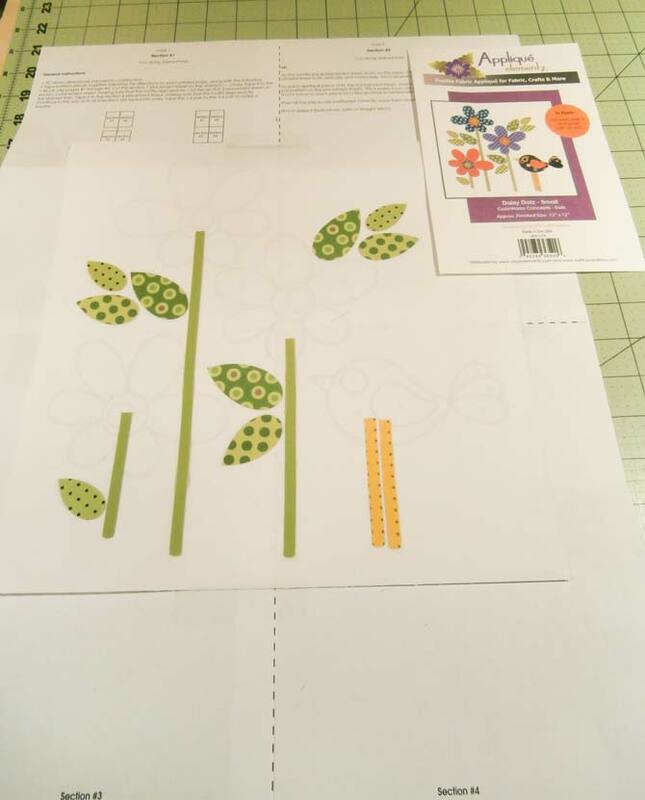 One of the great things about the appliqued pieces is that when you place them on your background fabric, you can simply press with your finger and the pieces will adhere lightly in place, which keeps them from moving. All of the applique pieces are now fused in place. I took the whole piece to my ironing board and ironed the pieces lightly to fuse them a little, then removed the appliqued cushion top from the paper design, and fused everything in place. I also turned it over and pressed from the back to be sure that everything was well fused. I decided that I wanted to add a border to my cushion since I wanted to create a 16″ x 16″ decorative cushion for a summer display. To finish the cushion, I used a 2¾” border. 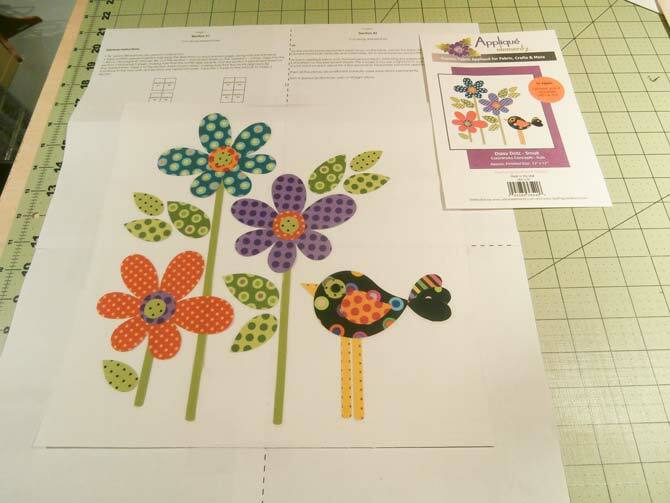 I cut two strips 2¾” x 12″ and added these strips to the 2 sides of my appliqued square. Next, I cut 2 stripes 2¾” x 16½” and added those to the top and bottom. Now all I need to do is machine applique the pieces, add a backing, and complete my cushion top. I love it. What a beautiful promise of summer to see these wonderful colors, the flowers, and the bird. A totally adorable project. 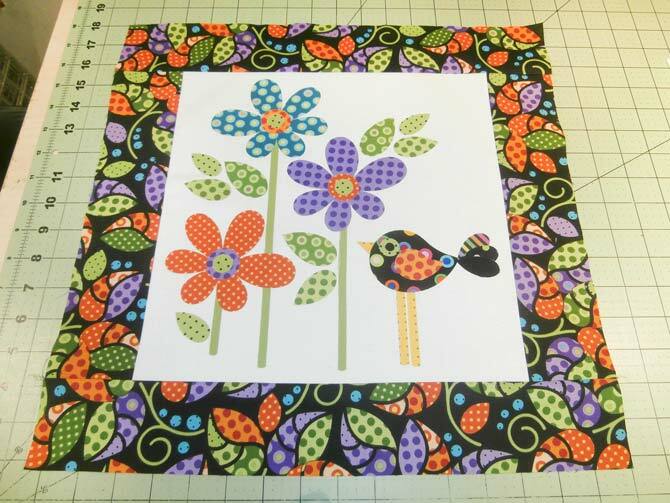 I thoroughly enjoyed working with these prefused appliques from Northcott’s Urban Elementz Applique collection, and can’t wait to do another, and another, and another!